This small town is easy to miss if you aren’t looking for it. Today, I am about 40 minutes north of Orlando, seeking a new “spiritual” experience. The town of Cassadaga, between Orlando, and Daytona, in central Florida, was founded by George P. Colby. Mr. Colby said he was led there through the wilderness from New York City by his spirit guide, Seneca, in 1875. 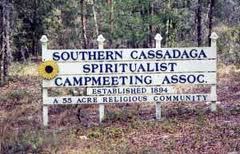 This spiritual community was established in 1894 and has 55 certified mediums residing in the Cassadaga Spiritualist Camp. Designated as a Historic District on the National Register of Historic Places in 1991, the Southern Cassadaga Spiritual Camp Meeting Association is the oldest active religious community in the southeastern United States. Across the street is the Cassadaga Hotel. Built in the 1920s, this 14 room hotel has a special healing room and the L’Aldia restaurant. L’Aldia serves an Italian inspired menu. Their Cassadaga Panini chicken sandwich was perfectly prepared and fresh tasting. I start to feel butterflies in my belly when I see my medium, a lovely pleasant looking Spanish woman, with long black hair. Our session will be in her home, just minutes away from the book store. I follow her by car on a well-kept, dirt road, which leads us to her modest home. I am not sure what I am going to hear, this is my first experience. An hour later, I leave her home feeling a great sense of peace. On the 5 minute drive back to the Cassadaga Book Store, reflecting on the information revealed in my session comes to mind – I feel empowered, and my mind is clear. The store is filled with books, candles, crystals, jewelry; everything you’d hope to find. The employees are helpful and encourage you to use your spiritual items as your intuition guides you. As I leave, I reflect on my afternoon and know I will return, even if only to experience the immense sense of peace. 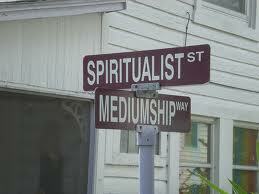 Cassadaga is a spiritual haven for those seeking spiritual healing. Bring your friends to share the experience.